Levi Wallace was a no-name, walk-on prospect at Alabama who ended up playing a monumental role in securing another championship for the Crimson Tide in his senior year. Despite his collegiate success, Wallace found himself as an undrafted free agent and, once again, had to walk onto a team to prove that he could play with the best of them. He finally has gotten the opportunity to show what he can do with the Buffalo Bills, and he has not disappointed, sitting as a top-five graded cornerback since Week 10. In his senior year, the unheralded defensive back played 782 defensive snaps and allowed a passer rating of just 44.3 when targeted, which ranked eighth-best among draft-eligible corners in 2017. He also refused to allow a touchdown all year and snagged three interceptions en route to becoming a mid-round talent according to PFF’s 2018 Big Board. Still, he went undrafted by the league. 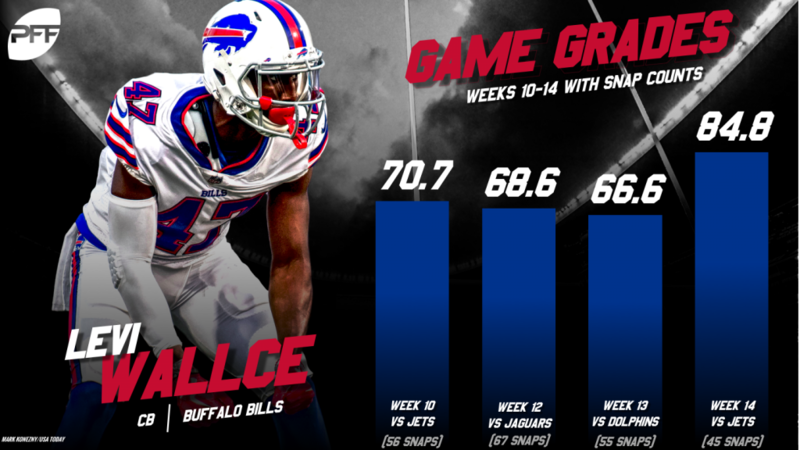 Wallace didn’t take a snap for the Bills until Week 10 but has looked like a seasoned NFL starter since then. Among cornerbacks with at least 100 coverage snaps in Weeks 10-14, the Alabama product’s overall grade of 78.8 and coverage grade of 82.1 rank fourth and fifth, respectively. In that span, Wallace has allowed only 50 yards (tied for first) and a passer rating of 58.9 when targeted (ninth). The undrafted free agent has also allowed completion on just 45.5 percent of the passes thrown his way, a mark that ranks tied for sixth among qualifying cornerbacks, and he has been making the offense earn every inch, allowing only four yards after the catch since Week 10. Looking at his efficiency and advanced metrics, Wallace’s performance this season is even more impressive, as he’s allowing a measly 0.43 yards per coverage snap- the best mark among cornerbacks with at least 100 coverage snaps on the season. Wallace is also yielding a reception every 23.4 coverage snaps, which is the second-best rate qualifying corners. The first-year corner has produced a forced incompletion rate of 18.2% on the season, tied for the 14th-best rate at his position in Weeks 10-14. He has been targeted on throws of 10 or more air yards five times, allowing only one reception for 29 yards and forcing two incompletions. Of course, it’s important to note Wallace’s opponents haven’t been too formidable in the four games he’s excelled in coverage. Opposing passing grades in order for the team’s he’s faced, in order of Week 10 – Week 14, are as follows: 31st, 25th, 29th & 31st. He remains to be tested against a strong passing offense, but playing well against poor-performing passing attacks is still a step in the right direction. Wallace has also demonstrated room for improvement when it comes to his tackling. Since his debut in Week 10, Wallace is tied for the fourth-most missed tackles (four) and has produced a tackling efficiency of just 4.5, which ranks 92nd out of 98 qualifying cornerbacks. Wallace disproved the doubters and detractors when he walked on at Alabama and became a stand-out player on their defense. After going undrafted, Wallace has walked on, this time to an NFL team, and again become a standout defensive player who is already making quality contributions at football’s highest level.